Despite its popular mispronunciation, everyone knows the name "Gouda" (HOW-da, not GOO-da), the quintessential yellow Dutch cheese that accounts for some 60% of the Netherlands' cheese production. Less world-famous than its namesake cheese, however, is Gouda the city. Within the Netherlands, the name Gouda is intimately connected with both the cheese and other products that the city excels in: Gouda stroopwafel ("syrup waffle") vendors are a fixture at outdoor markets, and reel in passers-by with the scent of warm caramel between two fresh-baked, waffle-textured cookies; fine candles and clay pipes are two more specialties of the South Hollandish city of 70,000. The city itself is a wonderland of monumental architecture, from its 15th century Stadhuis (City Hall) to its cruciform Sint Janskerk (St. John's Church); summer visitors can also watch the centuries-old cheese market in action each Thursday. Just 55 minutes from Amsterdam by train, historic Gouda is a convenient, and worthwhile, day-trip destination for travelers who want to venture outside the capital. By train: Several trains per hour run between Amsterdam and Gouda, either direct or via Utrecht; travel time is around 55 minutes. Gouda cheese and crafts: Naturally, tourists who visit Gouda expect to find evidence of its cheesy reputation, and the city delivers with its summer Kaas en Ambachtenmarkt (Cheese and Crafts Market). 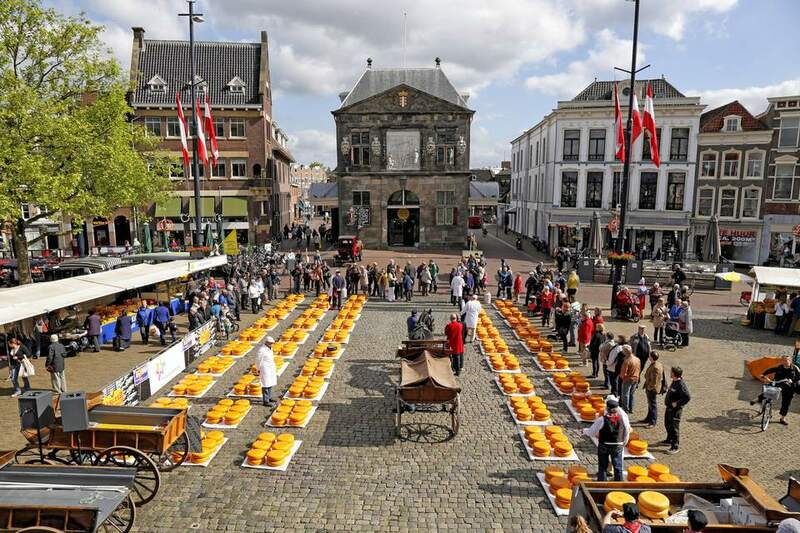 Just like in cheese-centric Alkmaar, spectators can watch traditionally-clad dairy professionals trade their wares in the shadow of the monumental Stadhuis (City Hall). Cheeseheads who visit outside the market season can still visit the Gouds Kaas- en Ambachtenmuseum (Gouda Cheese and Crafts Museum) to explore Gouda's traditional products - which can also be purchased in the first-floor shop. Small-batch, unpasteurized Gouda cheese can also be found at 't Kaaswinkeltje, one of the finest cheese shops in town; for a broad assortment of local and imported cheeses, plus coffee, wine, and condiments, check out Lekker Gouds. Stadhuis van Gouda: Gouda's Stadhuis (City Hall) isn't just the backdrop for Gouda's famous cheese market: this 15th-century beauty is actually one of the oldest Gothic city halls in the Netherlands; its fame has even earned it a life-size replica in Huis ten Bosch, a Dutch-themed amusement park in Japan. The vivid statues that pose before the limestone facade - the personified values of Wisdom and Constancy, as well as historical dukes (and a duchess) - are later additions from 1695 to as late as the 1960s, respectively. The interior is bedecked with masterful tapestries from Gouda's own David Ruffelaer, who wove them for a 17th-century royal visit. Each December, the city hall is illuminated from inside and out by thousands of candles in the yearly Christmastime event, Gouda bij Kaarslicht. Sint Janskerk (St. John's Church): A superlative church in so many ways, the late Gothic basilica Sint Janskerk is an icon of Gouda. Dedicated to John the Baptist, the patron saint of Gouda, the Catholic basilica was turned over to the Protestant community in the 16th century, which accounts for its cruciform shape. Its 123-meter span from east to west provides ample space for one of the church's most distinctive features: the Goudse Glazen, or Gouda Stained Glass, which depict Biblical and historical scenes in their 71 panels, most of which date back to the 16th century. Gouda's museums: Besides its Kaas en Ambachtenmuseum (Cheese and Crafts Museum, above), Gouda has a number of small but well-appointed museums. Of special interest to history buffs are the museumgoudA (quirky capitalization intended), which retells a millennium of city history by means of artifacts and temporary exhibits; and the Verzetsmuseum Zuid-Holland (South Holland Resistance Museum), which immortalizes the bravery of those in the Dutch World War II resistance. (Note that Amsterdam also has a Dutch Resistance Museum, named Best Historical Museum in the Netherlands.) The Museumhaven Gouda (Gouda Museum Harbor) is a dock where 18 monumental ships are moored; spectators can come to admire the mostly early 20th-century vessels up close and stop for a drink at the historic Museumhavencafé. Restaurant De Mallemole (Oosthaven 72): Situated in a handsome canal-side monument, its walls lined with silk-screens from renowned Rotterdam artist Julien Landa, Restaurant De Mallemolen is a feast for the senses. Inventive, seasonal menus allow the chef to serve the freshest meals to a satisfied clientele. Siroopwafelbakkerij van Vliet (Lange Groenendaal 32): Taste siroopwafels (syrup waffles) at their most refined at Van Vliet, who have practiced their trade for over a century. Stop by the lunchroom for a mid-day meal, snack or siroopwafel, or learn more about this traditional specialty with a tour or workshop (by appointment). In de Salon (Karnemelksloot 1): A Gouda institution, In de Salon claims to be the oldest pancake and poffertjes house in the world, with over 250 years in the business. The dark wood and copper accents of their merely 150-year-old premises lend an air of historicity to mealtime.